Enzyme-Linked Immunosorbent Assay (ELISA) is a quantitative and sensitive plate-based assay designed to detect and quantify substances such as antibodies, hormones, proteins and peptides. Several applications can be used; as a direct or competitive measure, as a sandwich method, or with ELISpot, which detects a signal (e.g. cytokine) from a single cell. ELISA Assay can also utilize adherent cells. 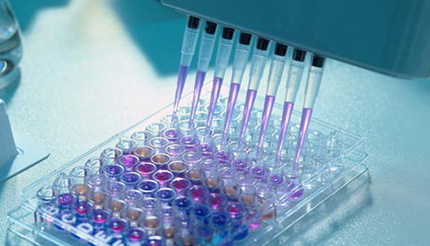 The ELISA Assay has been a workhorse method since the 1970s. Our scientists have decades of experience developing these methods, even at pg/mL levels in a complicated matrix such as serum, with detection levels of 1 part per 10 million. We believe the best way to learn your needs is via a real time conversation. We always prefer to start with a discussion to assist you in meeting your goals. Click the orange button and we’ll get right back to you. The ELISA Assay utilizes an immobilized layer to either capture the analyte of interest (typically an antibody, hormone, protein or peptide) or immobilize the analyte directly. Most ELISAs are performed in a 96 multi-well format. Non-specific sites on the plate are blocked with a protein, such as bovine serum albumin, followed by attachment of a specific primary antibody directed to the analyte which may be enzyme-linked. If the primary antibody is not enzyme-linked, then a secondary enzyme-linked antibody directed to the primary antibody is used. Subsequent development of the substrate will result in a measurable signal. Some of the numerous ELISA Assays we perform are the RIA (RadioImmune Assay), small molecule detection with a competitive ELISA, multiplex (measuring many analytes within the same well), phosphorylation of proteins, as well as cell based ELISAs and many more variations. ELISA can provide both qualitative and quantitative results. At Marin Biologic Laboratories, there is an option of running your valuable samples using our Ella platform which may produce results with less variability, larger reading ranges and better sensitivity over other methods. Ella utilizes a Simple Plex cartridge so each immunoassay is run the same way every time, eliminating manual steps, washes or reagent additions. Ella is also volume-independent eliminating the variability that may arise with every sample handled the same way. From the beginning and ongoing, your assay is a critical component of the life cycle of your current or eventual product. That is precisely why you want experience and expertise at the earliest possible stage of your development. When you need an assay to prove your science and there is no commercial kit available, you need a custom assay. Our extensive expertise will quickly and methodically develop your assay to prepare it for eventual validation. Typically an assay can be developed from scratch in 5 or less experiments while minimizing any matrix effects. We are firm believers in kits. The analytical portion of the assay itself is only a single component of what it takes to perform a successful experiment. It is all the other skills, experience and GLP/GMP conditions that we do day in and day out that will save you time getting to the results you actually want yesterday. We can create and distribute kits, too. Many companies planning an IND submission or in Phase I/II may only require a well-qualified assay rather than a fully validated assay. You may or may not need GLP/GMP stringency and auditability yet. Our scientific team works with your scientists to qualify your assay for reproducibility, appropriate precision and accuracy. To validate an assay is to measure precision, linearity, accuracy, robustness, system suitability and repeatability. To achieve these results, we conduct multiple experiments in a pre-validation phase with the assay. This phase is a series of 2-4 experiments that specifically look at these capabilities. Once we have advanced an assay, we perform the assay 2 more times for a total of 3 identical repeats. At that point, your assay meets the FDA GLP or GMP requirements. Whether patient samples or drug product samples we will map out a timeline and follow through with sample receipts, meeting your regulatory needs at all points. We perform your assay as developed, qualified or validated, and promptly communicate the results and/or Certificate of Testing for any or all of your preclinical or clinical phases. Knowing the importance to the FDA of lot release potency testing, our scientific team tests every manufacturing lot with your assay providing Certificates of Testing in a timely manner, under GMP Condition. In order to determine shelf life for a particular drug substance, stability tests are performed at pre-determined calendar intervals. Our project coordinators communicate closely with you to anticipate the arrival of samples so as to have our staff and resources available for timely analysis and submittal of data and Certificates of Testing. ELISAs with extreme sensitivity and in very complex matrices are our specialty. We collaboratively work with your scientists to ensure that the ELISA Assay is applicable for the number of years needed, selecting appropriate vendors, acquiring forecasted volumes of critical reagents necessary to perform the assay over multiple years. We have conjugated the enzyme or other markers, such as biotin, to proprietary antibodies in order to further customize the ELISA Assay to client specifications. Our collaboration with your scientists ensures the success of your project now and in future years. 378 Bel Marin Keys Blvd. Marin Biologic Laboratories is an FDA registered Contract Laboratory that provides both Research and GLP/GMP services. We specialize in pre-clinical and clinical development, drug discovery and validation for biopharma companies with deep expertise in cell-based assays and immunoassays. Our unique approach to collaboration encourages scientists to talk to scientists to create better science. © 2019 Marin Biologic Laboratories — All Rights Reserved. I consent to receive communications (which may include, phone, email, social, and re-targeting ads) from Marin Biologic. I understand I may proactively manage my preferences or opt-out of communications with Marin Biologic at any time using the unsubscribe link provided in all of Marin Biologic's email communications. I confirm that I am over the age of 16 and I consent to communications from Marin Biologic.